Looking for your dream venue? Here are some of our favourite venues, all ready for your wedding! Situated in a heritage listed building in Fremantle, Moore and Moore offers a unique Wedding experience that you will make your special day unforgettable. Boasting a beautiful, hidden Courtyard and an eclectic style venue, Moore and Moore is a favourite for many. As Fremantle's newest venue, Whitespace Gallery has already collected many stories. It is a unique space, situtead in a heritage building in the heart of Fremantle’s West End, incorporates art into special events forming the perfect backdrop for any Wedding. Located in the heart of Fremantle’s iconic Fishing Boat Harbour, The View offers a fresh, bright space with modern finishes and an unsurpassed ocean view. Situated on the Banks of the Swan River, the Mounts Bay Sailing Club is a unique venue, offering a picturesque waterfront location that your guests will remember for years to come. Perfect all year round, the Club is the ideal blank canvas to create your dream wedding, offering both indoor and outdoor venue options, all with spectacular, uninterrupted river and city views. Whether it’s a waterfront ceremony on the Club’s expansive lawns, an intimate gathering for 30 guests, or a formal banquet for 300, the classic style, magnificent views and exceptional level of service make it the perfect choice for your special day. This New York style warehouse Photographic Studio is located on Old Aberdeen Place in West Perth. Recently renovated by the Owners, the space has been designed as a canvas for creativity, including characterful white textured walls, polished concrete floors and large sections of exposed brickwork. There are two main studio areas both of which can be hired out for Wedding Ceremonies and Receptions and able to accommodate both Large Sit Down or Stylish Cocktail Events. The Bell Tower is a stunning six storey complex, complimented by a grand glass entry foyer and a sixth floor Observation Deck, making your function a unique opportunity to experience the richness of history while guests enjoy refreshments overlooking the most spectacular 360 degree view of our beautiful Perth city and its Swan River. One of Perth's best outdoor locations, Matilda Bay Reserve is a very popular location for both Wedding Ceremonies and Receptions. Only minutes from CBD the Matilda Bay Reserve has 5 locations which can be booked, and although each is slightly different and unique in its own way, they all have beautiful river views from the banks of the Swan. There is easy access to all sites and ample parking available. Situated in the Araluen Botanical Gardens, The Forest View Deck offers an elegant 21mx9m white marquee on a beautiful 500sqm Jarrah deck surrounded by lush Rose bushes and Eucalyptus forest. The venue has direct access from Carpark No2 and the Rose Garden and is located near toilets The Marquee possesses five 600mm sphere pendant lights in white weave in the main area. The deck has flood lights illuminating the surrounding flora and across the pond, making this an idyllic location to host both your Ceremony and Reception. The Sunken Garden is an intimate amphitheatre with gardens, ponds and terraced lawns and is a beloved feature of the University's beautiful campus, popular for both Ceremonies and Receptions. 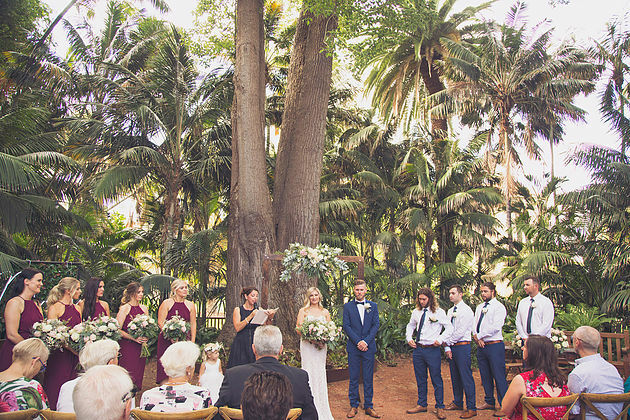 The beautiful botanical garden in all its glory is the perfect back drop for the perfect Wedding. Situated in the heart of the University under a canopy of tall trees and surrounded by a Tropical Forest, the Tropical Grove boasts another spectacular Wedding location. Perth's newest warehouse events space! This newly renovated warehouse space is now open for events for the first time. An exciting blank canvas for all styles of events and functions, and they welcome all creative uses of the space. Located 5minutes from CBD, this accessible venue is unique and extremely diverse and can offer something a little different to the average Wedding.